H2_HAMMAM is the new Makro SPA, steam bath, shower unit for the home and hotel industry. A unique product that combines the functionality and essential design of a shower cabin with the pleasure of the hammam. H2_Hammam is a steam bath-shower suitable for both private and contract sector, displaying a pure and essential design that allows you to recreate at home a unique, personal and personalized space, dedicated to the well-being of body and mind. The H2 Hammam shower units tend to become a very popular product among homeowners due to their appealing designs and unmatched functionality. Accurate design is stressed out by the profile-free pivoting door in glass, available in transparent, bronze or smoky finish. The minimal handle is in anthracite aluminum. H2 Hammam introduces the latest innovative luxury for the bathroom offering cutting edge technology encompassed within a self-enclosed shower cabin. You can treat yourself to total body spa treatments or small spa sessions. Inside the H2 Hammam you can take your time and relax. The well engineered shower unit offer a luxurious ultra contemporary solution suited to complete the look of any bathroom design. 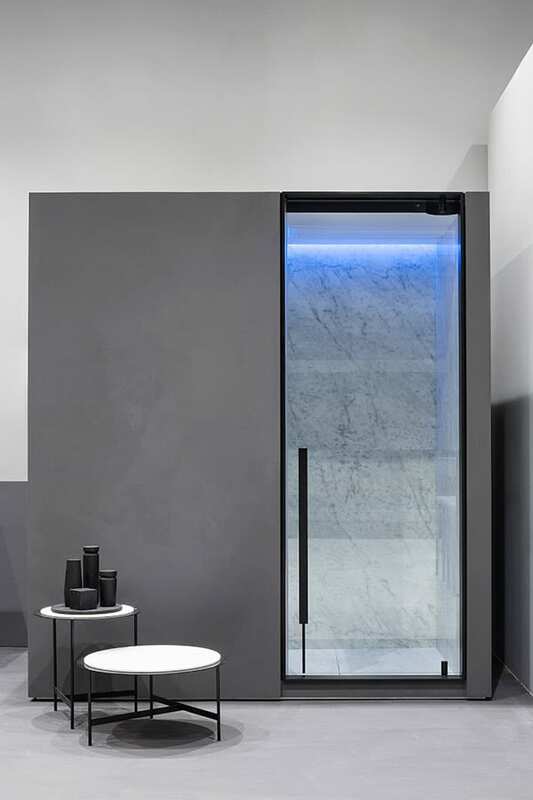 H2 Hammam, designed by Giulio Gianturco and Makrodesign team for Makro is a series of shower cabins designed for those who want a predominantly functional and practical product without excluding elegance and aesthetics. The acronym SPA that everyone uses now for wellness comes from the Latin “Salus Per Aquam” and actually means “Health Through Water”. Without any heat dispersion, the steam stays inside the cabin, so if you like steam room, you can enjoy a pleasant, relaxing and beneficial moment. Founded in the 90’s with the aim of developing innovative concepts and products for the bathroom, Makro’ s main aim was to manufacture products with new technical and construction features, in order to meet the planning requirements and solve the on-site building problems becoming famous world wide for introducing some innovative concepts, such as under-mount bathtubs and floor-flush shower trays.